1 x Shaving head. It gently removes hairs as short as 0.5 mm from the root and protects your skin against pulling. 1 x Cleaning brush. Satinelle removes even fine short hairs while being gentle on the skin for comfortable and complete hair removal. 1 x Satinelle wide epilator (mains powered only). INCLUDES Wide Head Epilator, Precision Epilator & Smart Tweezers. Full details below. Unique ceramic material for better grip. Shaving head. Featuring our widest epilation head, this epilator removes more hairs in one stroke for quick, efficient hair removal. Satinelle is designed with ceramic tweezing discs that lift and gather lying hairs, guiding them to the best position to remove them from the skin. Epilator also for sensitive areas. Enjoy perfect long-lasting smoothness. Mains epilator: No. Precision epilator batteries: 2 x AA. • Limited number of discs reduces the skin sensation. • Cleaning brush for easy cleaning. Satinelle Advanced Wet & Dry Epilator. Extra-wide epilator head. First epilator with S-shaped handle. Two speed settings. Unique ceramic disc material for better grip. Full Australian Manufacturer Warranty. Gently removes hairs, as short as 0.5mm, from the root. This epilator has gentle tweezing discs to remove hairs as short as 0.5mm without pulling the skin. This epilator has a washable epilation head. Depilator Satinelle HP6420/00. Delikatnie usuwa włoski, o długości nawet 0,5 mm, wraz z cebulkami, dzięki czemu skóra może zostać gładka przez cztery tygodnie. Po prostu gładkość na dłużej. Szybki i delikatny depilator zasilany sieciowo. Hair sheds naturally and regrowth is inhibited. Intense pulsed light is a hair removal system to prevent hair growth. It’s an easy-to-use, hand-held device that applies gentle pulses of light to the hair root, causing hair to shed naturally and hair regrowth to be inhibited, achieving the result of everlasting smoothness. 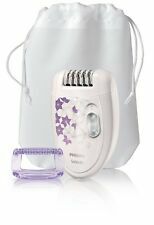 Satinelle Prestige Wet & Dry Epilator BRE652/00. Our epilator head is unique in being made from a textured ceramic surface that gently extract even the finest hairs and those 4x shorter than wax. Now with faster disc rotation than ever before (2200RPM) for our fastest hair removal. The hair removal is supported by the integrated Opti-Light, with its unique lighting no hair is overlooked. The s-shaped handle provides for easy application to the entire body. Product Type Epilator. Combined with the integrated Opti-light, you can trace and remove even the finest hairs from your body. Smooth skin: Suitable for legs, body and face including underarms, bikini area and upper lip in or out of shower. Fully charging the batteries takes up to 1 hour and 40 minutes. 2 Insert the small plug into the device and put the adapter in the wall socket. -- The charging light flashes white to indicate that the appliance is charging. Depilator HP6422/01. Zastosowane delikatne dyski depilujące zapewniają łatwe usuwanie włosków bez pociągania za skórę. Dwa ustawienia prędkości pozwalają usunąć drobne i trudno dostępne włoski. Okres gwarancji (miesiące): 24. Pierwszy depilator z ergonomicznym, zakrzywionym uchwytem. W połączeniu z wyjątkowymi, okrągłymi dyskami ceramicznymi zapewnia depilację blisko skóry, co daje optymalne efekty przy większej delikatności. Active hair lifter vibrates and removes even flat-lying hairs. Active massaging system stimulates and soothes the skin. Hypo allergenic textured ceramic discs gently remove hairs. Eyebrows of care by attaching the trimming comb is also possible. scratch-resistant, even as it is placed in a strong pouch or bag in shock, scratch-resistant, the strong impact it features. We do our best for you!! 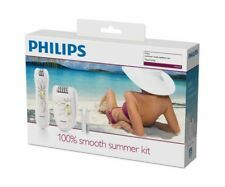 Philips Satinelle Advanced Wet Dry Epilator Legs Body Face Hair Removal BRE6300. First epilator with S-shaped handle. Our epilator head is unique in being made from a rough ceramic material that grabs hair firmly, even fine hairs won’t slip from its grip. Combined with the unique round ceramic discs it epilates closer to the skin for optimal results and more gentleness. Eyebrows Body Hair Shaver. 1 Eyebrows Comb 2, 4mm on Each Side Included. Cordless Battery Powered Electric. 4, 16mm Electric Blade on the Each Side of Head. Body is NOT Washable. Size : 5 x 6.3 x 21 cm. First epilator with S-shaped handle. Includes massage cap, shaving head, trimming comb and facial area cap. Shaving head. Trimming comb. Facial area cap. Delicate area cap. Massage cap. Basic pouch. Kolor główny: Biały. Materiał wykonania: Tworzywo sztuczne. Regulacja prędkości depilatora: 2 stopnie. The SatinSoft range is ideal for those with very sensitive skin who looking for a gentle solution to long lasting hair removal. This epilator includes a small cleaning brush to help you remove loose hairs from the epilator discs. Kolor główny: Biały. Regulacja prędkości depilatora: 2 stopnie. 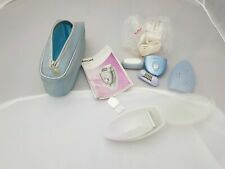 Philips Satinelle Advanced Wet & Dry Epilator (White/Ice Blue) Free Shipping! Satinelle Advanced Wet & Dry Epilator (White/Ice Blue). Our fastest ever epilator has unique ceramic discs that roate at a greater speed than ever before and firmly grip fine and short hairs. Our epilator head is unique in being made from a textured ceramic surface that gently extract even the finest hairs and those 4x shorter than wax. Illumination level: 5. Light beauty with Alma essential pink. Power cord length:1.95m. Body material: ABS resin. Weight: 360 g. Manufacturer part number: SC1991/00. If you get it as quickly as possible. 1 x Satinelle epilator. Smooth skin: Suitable for legs, body and face including underarms, bikini area and upper lip in or out of shower. 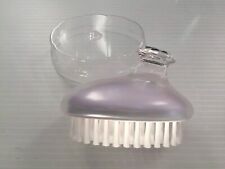 1 x Exfoliation brush. 1 x Skin stretcher cap. Quick and easy results: Distinct textured ceramic discs firmly grip and remove even fine hairs from your skin.